The CS Series of Martin guitars has entered its third year with the introduction of a new model for 2013. And for the first time, the master craftspeople at Martin’s Custom Shop have added an Orchestra Model to the line, the CS-OM-13. Features include: Madagascar rosewood back & sides, high altitude Swiss Spruce top, scalloped Golden Era style 5/16” top braces, exclusive mix of Adirondack and Sitka spruce bracing, quilted bubinga body and fingerboard binding, exclusive pearl-bound, scalloped red diamond fret markers, Madagascar rosewood bridge plate. With its combination of contemporary design and historical features, the CS-OM-13 offers new dimensions in tone and aesthetics, while emulating some of the best, traditional Orchestra Models ever created. Built for resonance and responsiveness, it is ideal for nuanced playing in the deft hands of a master fingerstyle guitarist, but it can just as easily hold its own when under the pick-and-strumming required for the cowboy songs of Gene Autry and Roy Rodgers, who first popularized the OM guitars of the early 1930s. The entire guitar is built with hot hide glue, normally an expensive upcharge at Martin. The back and sides are made from solid Madagascar rosewood that comes with a high gloss finish. Madagascar rosewood offers cosmetic beauty similar to Brazilian rosewood while including grain patterns found nowhere else. And for sound, it has dazzling high harmonics singing over its distinctive tonal pallet, which might be described as a combination of open mahogany clarity and rich rosewood complexity. The top is also finished in high gloss and made from “high-altitude Swiss spruce”, which Martin unveiled on some of the 2013 models. Although Martin apparently used some spruce from Switzerland on some recent guitars, under the name “European spruce,” the spruce on this model is reputedly harvested only during the winter months, before the new moon from the snows of the Swiss Alps. Violin makers feel this spruce provides increased stiffness and dynamic range when milled to lighter weights than other Alpine spruce, or Carpathian spruce. All are the same species but come from different microclimates. Comparisons have been made with the spruce used on Stradivarius violins and celli. It is now believed that particular spruce grew during an abnormally cold period in European history known as the “Little Ice Age,” which resulted in consistent, slow growth and low sap content. Due to climate change, those hoping to get this species of spruce today with qualities similar to the Stradivarius spruce must look elsewhere than the forests of Italy where it originated. But scientific research has suggested it can still be found in climates with lengthy but stable winters. One such choice is the “moon wood” from Switzerland. The soundboard on the CS-OM-13 prototype I played reminded me of Carpathian, as it had a bit more definition and “ping” to the fundamental notes, and a bit less of the warm pastel glow in the resonating undertone heard from the Italian Alpine spruce used on other Martins. It displays a uniform, buttery complexion, with tight grain, that is evenly spaced and very straight, with loads of shimmery cross grain. Other examples of this model sport noticeable bearclaw anomalies, also known to woodworkers as hazelficte, thought by some luthiers to signify older, stiffer wood. 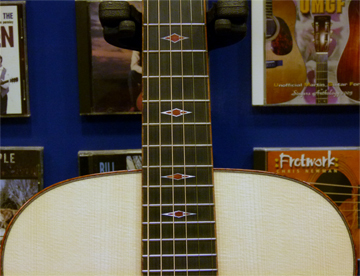 The hand-fitted, dovetail neck has typical Martin OM widths of 1-3/4” at the nut and 2-1/4” at the 12th fret. And it is matched with modern OM string spacing of 2-1/4”, which may seem narrow to vintage guitar fans, but it should appeal to a wider population of modern players. The neck itself has a satin finish, and is made from one piece of solid Big Leaf mahogany reinforced with a two-way adjustable truss rod. And like the other CS models, it is carved and shaped entirely by hand, to what has become known as the Custom Shop #1 profile. To this player’s hand, I would say the CS neck is inspired by traditional Martin necks, but without the bulk in the upper frets, or the pronounced V. Yet it still feels related to a vintage Martin more than the “low profile” or “modified low oval” found on other modern Martins. I might have named it the “low vintage” profile. One interesting feature, the stain on the mahogany is considerably lighter than many Martins, and almost caramel in appearance when matched with the dark, earthy stain used on the rosewood body. This allows the guitar to fit in visually with the earlier CS models, the first of which, the CS-21-11, had a light-weight neck of Spanish cedar. In a combination of traditional and modern design, the black ebony bridge is cut in the 1930’s shape, but has a short, drop-in saddle to work more easily with an under-saddle pickup. The fingerboard is made from the same ebony and the fret markers were designed specifically for this model. They are scalloped diamonds of a dark red hue that look like polished spiny oyster stones, but are replicas made of a stronger, synthetic material created from crushed gemstones. Each of the seven diamonds is bound with glinting, polished abalone. They get shorter and wider as they go up the neck, to match the spacing of the frets, with the outer points of the diamond always directly inside of the 2nd and 5th strings. So, at the 3rd fret, the first diamond is as wide as it is tall, with an ample piece of red stone. But at the 15th fret, the final diamond is a long, narrow cat’s eye, with a thin slice of red winking out from the pearl outline. The overall effect is quite beautiful. The pearl ends there and they wisely used the Style 28 rosette done in traditional wood fiber, which is also used for the purfling around the body. The Golden Era OM pickguard is made in high-quality Delmar style, of faux tortoise shell. To continue the theme of old meets new, the tuners are open-back nickel Waverlys, but with snakewood buttons that set off the headstock’s Madagascar rosewood faceplate very nicely. And the C.F. Martin & Co. decal is done in silver, as with all guitars of the CS Series. The quilted bubinga wood that binds both the body and the fingerboard is gorgeous, with a light orangish-red tint and dark, brick red accents that tie together the colors of the mahogany neck, the rosewood body, and the oyster stone inlays to unify the overall aesthetic. It is just one more feature that sets this Martin apart, and declares that the Custom Shop has produced a fingerstyle guitar that belongs in exclusive boutiques alongside the instruments from any small-shop luthier building today. But for all its top shelf looks, some of the most interesting features are hidden under the hood. The CS-OM-13 has a Madagascar rosewood bridge plate (! ), a first for Martin. They also feature a combination of different spruce for the bracing. The X brace is made from stiff Adirondack spruce, while the adjacent traverse braces and tone bars are all made from softer Sitka spruce. Just as interesting to me, they went with 5/16” top bracing, instead of the thinner 1/4″ bracing used on other Martin OMs since they reintroduced the design to their catalog in the 1970s. But the braces feature Golden Era style scalloping, which has more pronounced scoops to the carving, reducing the overall mass of each brace. To my knowledge, this is the first time 5/16” Golden Era style bracing has appeared on a non-dreadnought Martin with a 14-fret neck. Although the original OMs from the 1930s had 1/4″ bracing, the width used for the main X brace was actually 5/16”. The first modern Martin to use this same hybrid bracing was a limited run made by the Custom Shop for Gryphon Stringed Instruments of Palo Alto, California, and reproduced the specs of the very first 14-fret Martin, created in 1929 for renowned banjoist, Perry Bechtel. The mixing of the spruces used to brace the CS-OM-13 seems to be an experiment aimed at achieving similar top dynamics, by employing brace wood of different flexibility rather than braces of different widths. As with all the CS models, the sound of this guitar is not quite like any other Martin, and the unique approach to the bracing is at least partly responsible. Greene explained it this way, “The idea of using different spruce species was actually inspired by wine makers who often blend different varietals of grapes to soften or balance their wines. Blending spruce species to create unique tonal properties was an area of design that we felt was underutilized in guitar design. Add a madi bridge plate to recipe and you’re suddenly in uncharted waters.” Similar metaphors of blended wines have occurred to us at One Man’s Guitar when describing the tonal differences in different species of rosewood. Apparently great minds do think alike. Eyes widen as one picks up the CS-OM-13, and they realize how the guitar is noticeably light of weight. Ultra-light, might be a suitable term for this OM, and as a result it has dynamics shifted decidedly to a lighter touch and nuanced style of playing. It is extremely responsive, putting out a lot of sound from the slightest effort. The balance across the six strings that made OMs famous is certainly there. The fundamental notes are nicely defined, while sitting over that “little, old wooden box” effect one hears in many vintage guitars, as if it has a built-in reverb unit. It is bright, open, airy and ringing. But that air below and around that top voice is pregnant with resonating tone. When played slowly with sustaining notes, sympathetic harmonics ignite all over the place. The bass strings, struck and left hanging in the air, conjure waves of overtones from the trebles, where an angel of great purity eventually appears on high to grace the harmonic choir. And down in the undertone of the lows and mids is found the spacious, but cloudless bottom end which, along with the reflective treble chime, sets Madagascar apart from the other rosewoods. Madagascar rosewood is the anointed heir to the legendary Brazilian rosewood that is now so rare it is cost prohibitive. Their tonal properties are similar, with Madagascar rosewood offering slightly less complexity than Brazilian and bit more brightness, with its harmonic spectrum shifted a ways out of the lows and low-mids and into the mids and trebles. So it has crisp, chimier notes and a somewhat drier, more open bass than other overtone-rich rosewoods. 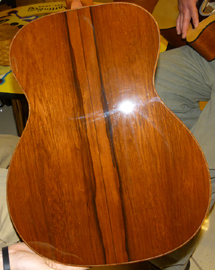 I absolutely love Madagascar rosewood as a tonewood and own three Martins made with it, compared to one in Brazilian. And I will declare here and now that this new Swiss spruce is a very good match for Madagascar rosewood. Spruce can add some aural filters to the sound of a tonewood. But mainly it accentuates or brings out certain qualities already there. This spruce is almost as reflective and quick as Adirondack spruce, so it brings out the Madagascar chime and definition very well, while that creamy quality in the undertone, heard in European spruce, but lacking in Adirondack, helps pull some warmth up out of the bottom end. Those of you lucky enough to play or own one of those recent Eric Clapton models, made with Madagascar rosewood and the Carpathian spruce tops, will understand just what I mean. In some respects, and despite all its progressive and experimental features, this new CS model sounded more “vintage” in its overall voice than many vintage reissue guitars. I thought it was absolutely lovely; woody, chimey, glowing, and very, very pretty. No guitar does everything equally well, and the dynamics of this guitar excel under a light touch, responding brilliantly to the slightest change in attack or string pressure. But it therefore does not hold up as well under heavier attack. It is perfectly good for strumming, playing leads with a flatpick and even full out Bluegrass flatpicking, up to a point. Once the strummer or flatpicker puts some serious muscle into their playing, the voice begins to compress, and even though it may get louder, it does not increase in genuine power or bass response the way larger or sturdier guitars do. And that is exactly how a Martin OM from the 1930s responds to heavy handed playing, as do the vintage 000s. And like those old-timers, a player simply doesn’t need to play this guitar that hard. It is so alive that the resonant sweet spot is reached with very little effort and provides ample volume and projection without the player having to force the issue. Players unused to such dynamics may feel they have to keep their foot on the break to not overdrive the top. But once one relaxes and allows the guitar to guide the player to “the zone of optimum response,” they will likely come to enjoy laying back and letting the instrument do all the work. The thing practically breathes on its own. Only time will tell if the top opens up to allow the kind of supernatural attack ceiling found in the ultra-light, pre-war Martins. Again we find a meeting of the traditional and the nouveau. Even if it has the Madagascar/Alpine chime that didn’t exist in the 1930s, it has a lot in common with the old OMs and 000s when it comes to woody resonance, responsiveness and sensitive dynamics. I would not say the overall voice is identical to a typical OM, or a typical 000, but it offers a bit of both. And that, I think, is where the unique bracing comes into play. The OM-ness shows up in the resonating tone that glows out from the body during light, sustained playing, and also in the impressive projection under light attack that can be attributed to the string tension of a long-scale neck on the Auditorium size top. The 000-ness shows up in how punchy the notes are when played with more power and how they pop out proportionate to the amount of snap in the strings from the picking hand, and in how the voice doesn’t break up under a heavy attack, so much as compresses during full strumming. The six strings press into a single, integrated sound like a fist of energy gathered in the midrange that is then shot out from the sound hole, its sympathetic overtones left a bit in the background like smoke around a canon. That is the hallmark of 5/16” bracing. Typical OMs don’t tend to do that. With lighter bracing, energy dissipates out around the body, so the fundamentals spread out more and the voice projects at a wider angle, with less midrange punch, but with more of an accompanying harmonic glow around the whole. Ultimately, it is a matter of subtle differences, since a 000 and an OM have the same size body and top. And with various design changes through the years, there is a lot of gray area when it comes to what defines one or the other. The CS-OM-13 offers a unique blend of the best features of both the traditional OMs and their close cousins, the 14-fret 000s. Having 5/16” scalloped bracing that includes a stiff Adirondack center, and more-flexible Sitka spruce for the outer edges, seems the likely candidate behind the hybrid tonal properties. It all makes this guitar a very good choice for someone who plays solo fingerstyle pieces, wants an alive and resonating vehicle that will take full advantage of the harmonic possibilities in alternate tunings, but also wants to play lead accompaniment with other guitarists and needs something with midrange pop and the definition necessary to clearly cut through the chord progressions, without sacrificing too much in the way of harmonic overtones. Given the tonewoods and special bracing, there would be little redundancy if this guitar was added to a collection that contained other Martin OMs or 000s. Overall – the CS-OM-13 is a tremendous success, while remaining a fingerstyle-first sort of instrument, and a welcome addition to the innovative Custom Shop’s line of guitars. Like its CS predecessors, it brings together bold new materials and features, along with vintage vibes and finely honed construction techniques. Fred Greene and the workers at Martin’s Custom Shop have created an admirable addition to the CS Series and Martin’s growing catalog. The Good – A gorgeous and lovely fingerstyle guitar, with exquisite responsiveness, that can hold up to moderate strumming, and offers a hybrid tone with the harmonic glow of an OM and the punchy mids of a 000, a comfortable, long-scale OM neck, and sumptuous boutique-esque appointments, all at a ridiculously reasonable price. I shudder to think of the sticker shock, if this exact guitar was ordered as a one-off custom by a working guitarist. The Bad – Some players may find things shifted too far into the delicate and pretty side of the spectrum. The voice compresses and can be overdriven under a heavy hand, without too much effort. This is not the mini-dred OM from the Standard and Vintage Series, but rather an ultra-light fingerpicker with ultra-responsive dynamics. The Ugly – They are only making this model during 2013, one guitar at a time, in the same Custom Shop that is building the Authentic Series and custom orders for dealers and their customers. So you better call around if you want to see one these in person before they are all snatched up by private citizens who appreciate a great guitar when they play one. Thanks go out to Mike Brennan for the fact checking! The official Martin Guitar page for the CS-OM-13 can be found here. I just received a custom shop OM18C with a lunar Swiss hi-alt top, thin finish, all hide glue………. Excellent news, LJ! I look very forward to hearing your impressions as you two get to know one another. One CS-OM-13 should have been enough for any sane individual, no? Well I now have two! I bought that second one that I describe as having less overtones, but more punch and set-up for speed and more aggressive right hand technique. I’ll call them my “Super Tuscans”, because, as you noted in your review, that High Altitude Moon spruce originated in Italy, but more importantly, the woods used for the bracing and bridge plate are a blend of woods, not unlike the the Super Tuscan wines from Tuscany, which are made from a blend of grapes grown in the region. I think the CS-OM-13 is one of the limited editions that will stand the test of time, and if I ever decide to sell one of them I will get back what I paid (and that can’t be said with many of the new Martins). I paid less than MAP for both. If you’re ever down by Philly, maybe on your way to CFM, let me know. I’d love to have you test run both units. I’m 40 minutes from CFM. We appreciate a man who know what he likes and goes for it! Reminds us of a few contributors to One Man’s Guitar, and One Man’s Malt come to think of it! TWO of them! You will have to spend equal time, so they don’t get jealous! And yes, photos of backs and tops would be very welcome. If you do not already frequent the Unofficial Martin Guitar Forum, and Acoustic Guitar Magazine’s forum, I am sure there are people there who would love to see your photos and live vicariously through your good fortune! thanks TSP (One Man) for the great review of the latest CS model. Based on your review, I ordered one, and began playing again after a 4-year hiatus. My new 13 is just splendid, sounds very much like the prototype you play in the video, with a voice like you describe. There is however, another one I had the chance to A/B for more than a few days,,,,,,this other one had more compression, not quite as loud, and way less overtones, and was set-up better for aggressive playing. At first,,,i suppose we all would say, go for the loudest one, with massive overtones and zero compression. After playing it for a few hours this other 13 (also new) opened up nicely in terms of volume, and it has better punch when played hard and fast. It’s a toss-up, which would be better by consensus. So my takeaway is that there are different flavors of this baby, probably all of them good, like any other Martin. Of the two flavors I’ve discovered, one sounds (and looks) like a Goodall OM with it’s round voice and slight compression and plentiful headroom; the other one sounds like something between a Lowden and a Collings…..yet both are blessed with that fundamental Martin growl and warmth underneath the hood. Thanks to the CS-OM-13, and the OneManz blog, for getting me behind the wheel again. That is excellent news, John! Congratulations. I hope the four years will soon be behind you and yur will be one to playing guitar for forty more. I have only seen two of the CS-OM-13, the prototype at the factory and the one currently on sale in New York City at Guitar Center. They were like peas in a pod. But it makes sense that other would have different personalities, like siblings in the same family. I enjoyed your description of the experience and how you heard and felt these two models differently. Please feel free to send along photos guitar@onemanz.com, should you care too. They have made changes to other CS models after they went into production, so I am curious to know if other tongue braces are out there. As you said, they will change and develop over time. I am sure your CS-OM-13 sounds wonderful and that it also sounds worse than it ever will, as it will only get more wonderful! My CS-OM-13 arrived from Mandolin Brothers the other day – I have not stopped playing it since it arrived. After considerable OM research, I bought this guitar after reading “One Man’s” review seen above and, man-O-man, it’s all spot-on and then some. This instrument plays like a perfectly prepared soufflé tastes; creamy, delicate, smooth, and very delicious (choose your own flavor). I know “One Man” prefers the fine-wine analogies but I see this machine as having something of a more caloric punch than a good cabernet. The OM-13 will now serve as a compliment to my, T-bone steak, Martin D-28 Maquis Madagascar. Between the two I plan to remain sober and get very fat. Thanks for the brilliant review One Man. Thank you so much for sharing the big news, and congratulations, Angus. I regret I did not get out to Staten Island to see that particular example before some lucky customer bought it. But I am very happy to know our review played a part in that lucky customer turning out to be you! I am trying to cut down on the fat in general, except that heard in the sound of Madagascar rosewood guitars, so allow me to toast your successful purchase with some mineral water and celebrate with banquet of rabbit food! Please feel free to send photos if you would like to share them with our readers. By the way, I find ice cubes work very well on tender fingertips. You have a poetic way of describing sound from an instrument that is not only accurate but a pleasure to read. I don’t own one of these ,but I wish I did . Thank you for your kind words, Colin! A wonderful concept, beautifully executed. Your style shines through with each phrase. I’m waiting for short stories or a novel. I absolutely loved reading the review of the CS-OM-13 with you playing in the background – your sweater was a dead give-away. Can’t wait to read more. These first few pieces from the archives were all gems. VERY good review. I own a CS-OM-13 and several other OM and 000 Martins. There really is something in the tone of the CS for which there is no reference point in any of my other guitars. I had wondered if that was related to the hide glue, (the CS is the first guitar I’ve owned with that feature), but, after reading your review, it seems that the unique tone may owe more to the peculiar bracing of the model. Thanks for sharing your insights so skillfully. Tone described as only TSP can. Very nice first review, Todd. Congrats on the launch of a wonderful new site and what I am sure will become a valued resource for we guitar weenies for years to come! Wow! Great stuff, TSP. I wonder how much that bad boy costs. If I have to ask, right… Everything here looks great, I know how much effort this takes. Well done.